Let's face it, I love to walk in the old areas of Jerusalem. I worked as an architect and love photography, so I shot some pictures of an aspect of Jerusalem that few people notice, but to me is very interesting - the windows. 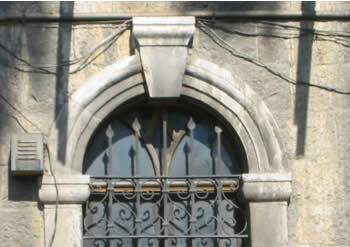 Now don't think me as strange, because it is really the tops of the windows that fancinate me, but I will explain why. 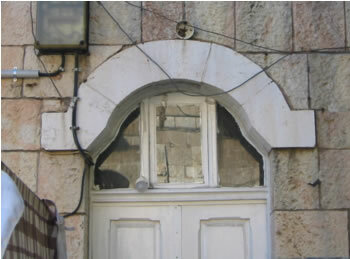 The windows in Old Jerusalem were arched. The reason was not for beauty; eventhough it does add a certain charm. The reason was a stuctual one. 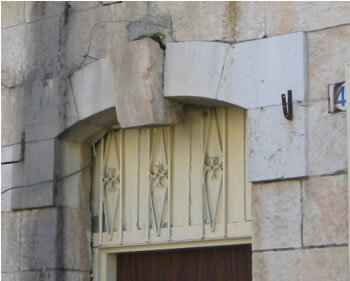 Since the building were made from large block rocks a support system was needed to span a "large" open area such as the window and door. This must support the layers of blocks above it. In the above photo, you will note that the center block, aside from being centered and made attactive actually prevents the wall from collapsing down in the window hollow. As the pressure on the center block, which is shaped as a wedge,is downward the side arch blocks do not allow it to slip down, instead the downward pressure strengthens the arch and gives it its support. Building was different a hundred years ago. Rock, block and more of the same. So it was the blocks that held the hollow window and door areas up. 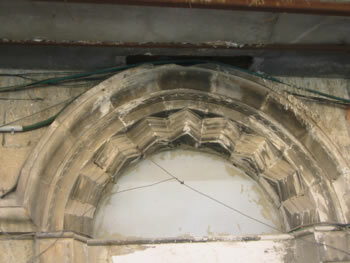 Sometimes the center of the arch was simple, and sometimes it could be decorative. 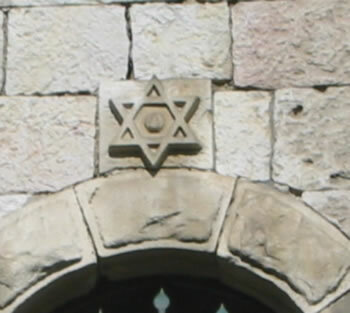 Often in Old Jersalem, the star of David was used as a emblem. 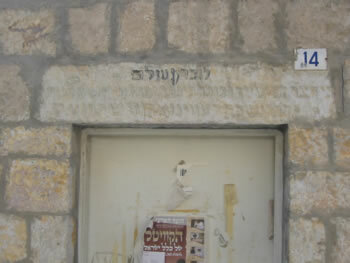 This was common in this period for it was the begining of the resurgence of the new yeshuv, the new settlements. 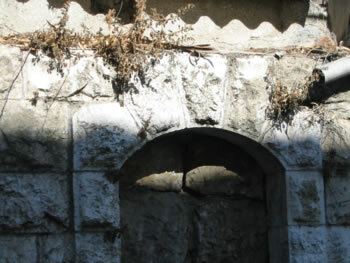 It was rare that a center stone would slip from its original location, but here we see one that has. I can not determine if it is due to the tennants doing some work on the building or just a freak slip. 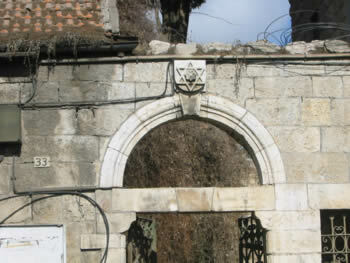 As I was doing my foot loose and fancy free look-see of Old Jerusalem, I happened into an interesting court yard. An elderly women saw me and called to see what I wanted. I told her that I was just looking at the old buildings. "Ah," see said, "let me tell you about this building and the reward for honoring one's parents. "Before the Russian revolution, my father-in-law was a young man, but extremely wealthy. His father was widowed and wanted to live in Jerusalem. So my father-in-law helped him settle here. "When the revolution came, my father-in-law received word that the Bolsheviks, members of the extremist wing of the Russian Social Democratic party that seized power in Russia in November 1917, wanted to murder my father-in-law and take his possessions. That night my father-in-law took everyone in the family and ran. He escaped with his life and decided to go to the Land of Israel, but the little money that he had was not enough and he had to borrow money to continue his journey. "When he came to Israel, he was broke. 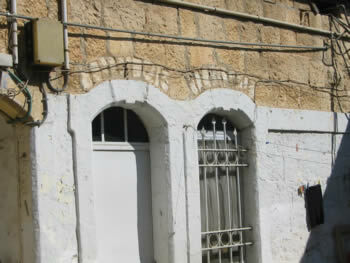 Had it not been for the fact that he honored his father, he would have nothing, but now his father owned this building. So my father-in-law moved in with his family and my husband, who was a very young man. 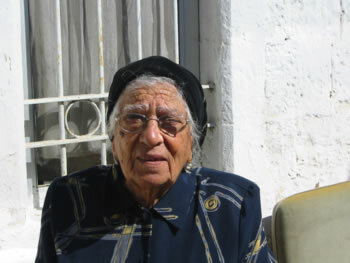 Here my husband grew up, and here we raised our family and I have lived here seventy years. All this, because my father-in-law spend money to honor his father." And I forgot to Ask Her Name! 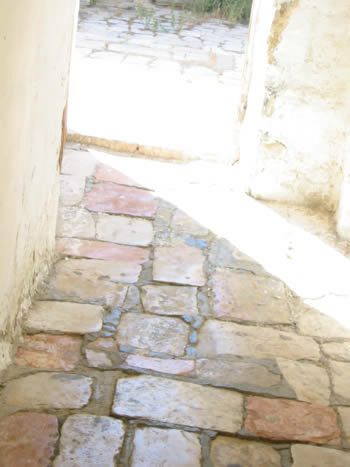 And as I left the sweet lady, I was treated to a bonus, the floor of her courtyard and the entrance had the original stone floor, over a hundred years old.